To say we get overly excited about Social Media Week Chicago (#SMWChicago) would be a complete understatement. It’s the one time of year us nerdy social media folks get to show up from behind our computers screens, talk face-to-face (IRL) and discuss upcoming tech and social media trends out loud. 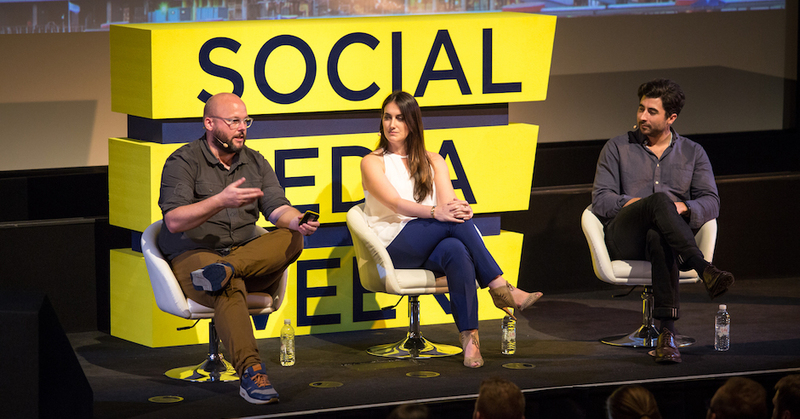 Over the course of Social Media Week Chicago’s 5-year lifespan, it’s been gratifying to watch #SMWChicago grow and adjust as various groups enter and join the conversation. This year, it was held at The Merchandise Mart—more specifically, in partnership with 1871, Chicago’s entrepreneurial hub for digital startups. Not only did this centralize the week’s events in one location, it also created a pleasant and collaborative environment filled with entrepreneurs and like-minded #SMWChicago attendees and speakers. Inherently, it was the perfect mix of innovation, grit and growth. Another notable difference this year was the emphasis on influencer marketing. The wide range of conversations surrounding this topic was inspiring and infectious. For those unaware of the term, influencer marketing is essentially employing brand influencers to push brand messaging via their individual networks. By doing so, brands are able to reach a wider, more authentic audience without sounding pushy or by overly selling themselves. In part two of our Social Media Week Chicago recap, we focus on the four biggest takeaways for fine-tuning your influencer marketing and creating relevance with your customers in 2016 (and beyond). Building relationships via social media is the new SEO—connecting your brand with real people is at the heart of what influencer marketing is all about and, if done properly, can be just as powerful as any back-end optimization. Authentic human interactions and experiences can’t be produced by a robot, algorithm or third-party program. First, dig deep for your brand’s authentic message. Second, find authentic people who are willing to help share your brand’s message with their audiences. Third, watch, listen and repeat. Just because you’ve entered the ‘influencer marketing world’ doesn’t mean you’re moving mountains. The loudest person in the room isn’t always the most influential. Use powerful advanced search tools (such as Facebook’s Lookalike Audience or Twitter’s Advanced Search) to find and establish the right influencer relationships and maintain those relationships when you find them. It’s also important to try new things, cultivate deep-rooted relationships and adjust accordingly. Some of your best (and most cost-effective) brand influencers may be the people sitting right next to you. Make sure to reach out to your employees and provide them with structured and shareable content. If your brand wants to take employee word-of-mouth content amplification a step further, encourage and create incentivizes for staff who act as brand advocates. Employees will always have something to say about where they work, make sure they have a positive story to share. Don’t push your brand, share your story and help others, the rest will follow. Start including your target brand influencers in the conversation early and invite them to take part in meaningful in-person events and experiences. Nothing creates brand loyalty more than influencers being your brand. Pabst Blue Ribbon shared this insight: “Rather than push our brand on people, we’re trying to help people and artists out. In turn, they share our story.” Invite others to take part in your adventure, and in turn they will become your brand story. A few other notable closing thoughts and takeaways: Use your gut on what you think is right and never waiver from it. Deal with negativity from your brand’s perspective and use it to your advantage. As cliché as it sounds, make sure you believe in yourself. And last but not least, context trumps content. Being in the right place at the right time is what matters most. Make sure your brand is in the right place at the right time with the right people and you’ll win every time.